Check out Tobi's Song For You Cold Shoulder Romper Let your shoulders take center stage on your next night out. The Rose Song For You Cold Shoulder Romper is a cute romper with a high neckline, fitted waist and deep keyhole cut-outs front and back. Long bell sleeves add a dramatic touch should you feel the urge to break into a power ballad. Let your shoulders take center stage on your next night out. 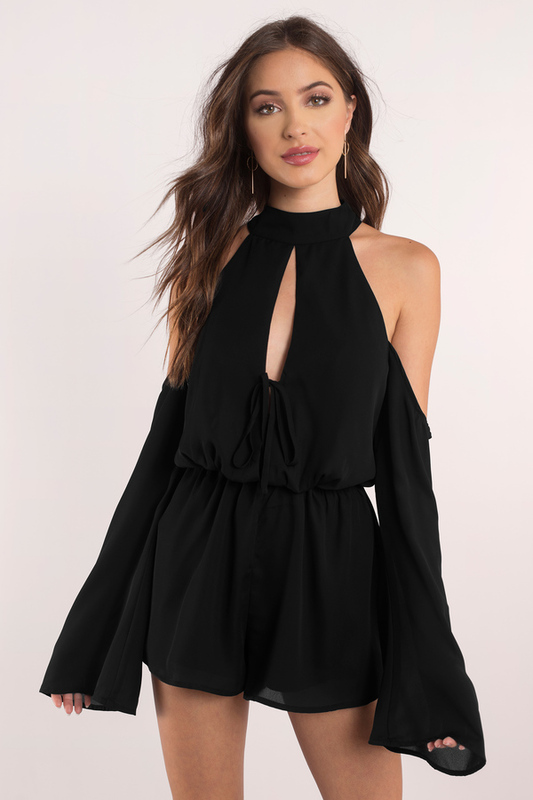 The Black Song For You Cold Shoulder Romper is a cute romper with a high neckline, fitted waist and deep keyhole cut-outs front and back. Long bell sleeves add a dramatic touch should you feel the urge to break into a power ballad. Let your shoulders take center stage on your next night out. The Rose Song For You Cold Shoulder Romper is a cute romper with a high neckline, fitted waist and deep keyhole cut-outs front and back. Long bell sleeves add a dramatic touch should you feel the urge to break into a power ballad.